A fun question is asked... Everyone writes down their guess. Feeling confident... Place a Meeple on your guess. Think your kids know better?... Place a Meeple on their guess. No idea... Place a Meeple on any guess and hope to get lucky! I don’t like party games and I don’t like trivia games. I like trivia, just not trivia games. I can come up with many useful facts, but never the useful facts needed for the question being asked. Anyway, I digress. 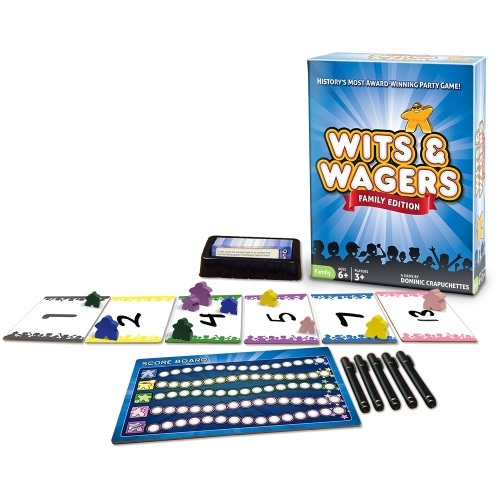 This game is the family version of the popular party game Wits and Wagers. The only differnece is that the questions are simpler and the game is more family friendly. Here is how it works. A question is asked with the answer being a number. All players write a number on a small cardboard card and then place them in the middle is order. Everyone has two meeples, a small and a large. Everyone takes turns bidding on which answer they think is right. A big meeple is two points and a small meeples is one point. After all have bid, the answer is read and points are awarded. You continue till one person has a set number of points. Why do I like this? Because I can bluff. If you don’t know, just make something up and figure out who the brainiac in the room is and bid on their card. It is more than just trivia, it is reading the room and using deduction. 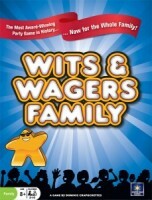 Add a Review for "Wits & Wagers Family Edition"